Scotland’s Gleneagles Hotel knows a thing or two about the golden age of travel. The sprawling grande dame, which was painstakingly renovated last year, has been a favourite hideaway for the well-heeled since state-of-the-art trains whisked the first guests to its dedicated station in 1924. And now, the property is putting that near-century of experience to work with the launch of its sleek Gleneagles & Co. handcrafted leather collection, a 17-piece line of small bags and travel accessories designed to make the journey every bit as elegant as the destination. 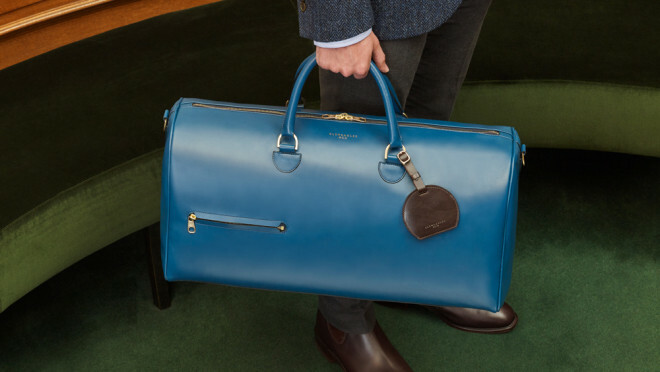 Berwick weekend bag Photo: Courtesy of Gleneagles & Co. Though the aesthetic of the collection’s weekend bags, briefcases, and holdalls is thoroughly modern—almost calling Berluti’s finely crafted briefcases and bags to mind with their clean lines and expertly placed external zippers—everything is inspired by the trains that first brought guests to Gleneagles’s 345-hectare estate (which was originally built and operated by Caledonian Railway Company). Styles are named for the stations along the route passengers from London would—and still do—take up to the property, and the bold navy, brown, and vibrant teal leathers recall the colours used to decorate steam trains during the early 1900s. Photo: Courtesy of Gleneagles & Co. 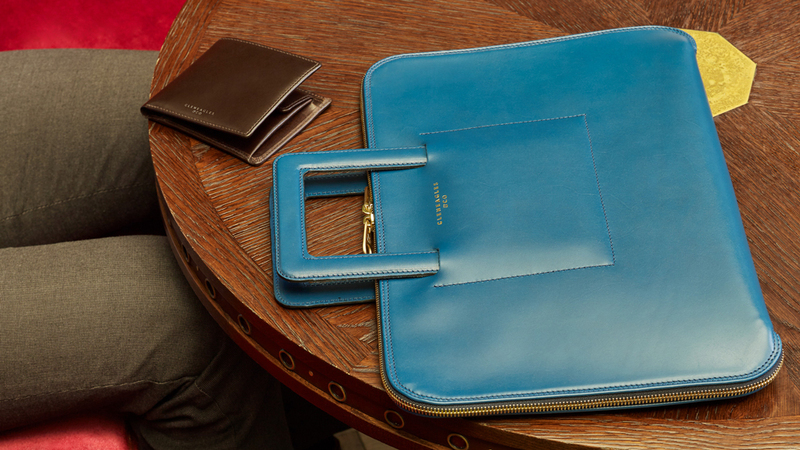 The larger pieces in the collection—namely the cylindrically shaped Berwick weekend bag (from $1,605), the roomy Haymarket briefcase (from $1,246), and the ingenious Edinburgh portfolio (from $709), which features handles that can be slid away when not in use—have been produced in collaboration with Tusting, a heritage leather brand and one of the last working tanneries in England. All look right at home in the cosy, country-house suites at Gleneagles, and the patterns that line the interiors of each have been inspired by vintage wallpaper discovered during the property’s renovation. 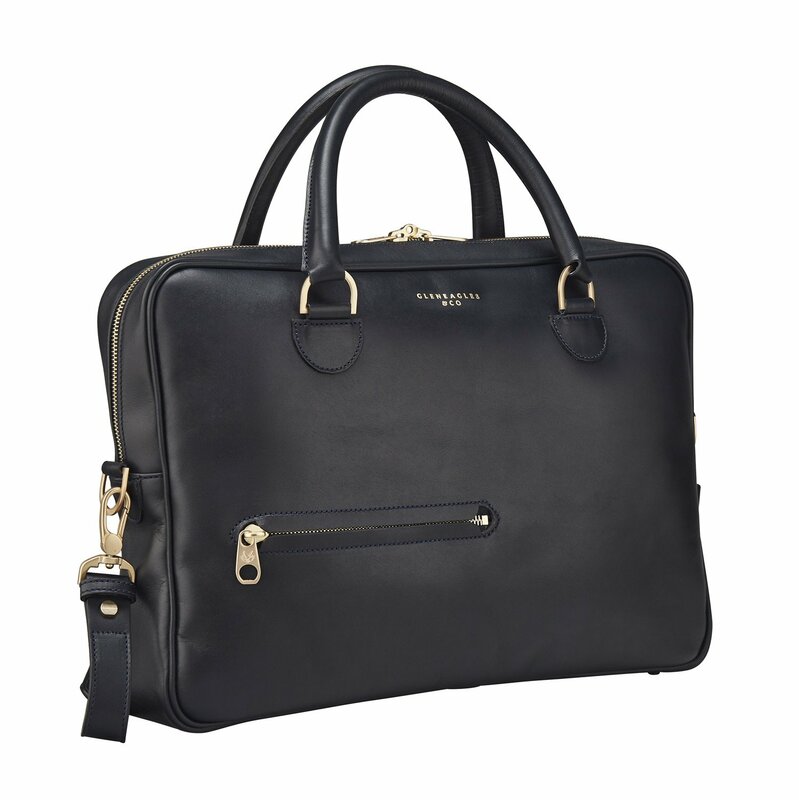 And while you hopefully can get away with not having to crack that briefcase open during your stay, the three styles are more than smart enough to pair with your favourite power suit for a day spent running to meetings in the city, as well. Gleneagles tapped Royal Warrant holder Launer London to produce the collection’s luggage tags, elegant phone cases, and functional wallets, which will be available to purchase online for non-guests later this year. Though if you are lucky enough to have a trip to the property on your itinerary, you can stop into the Gleneagles & Co. shop to pick one up—and while you’re there have your initials engraved on your new travel companion.